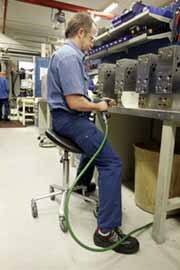 The only saddle chair suitable for heavy-duty industrial applications and larger individuals. 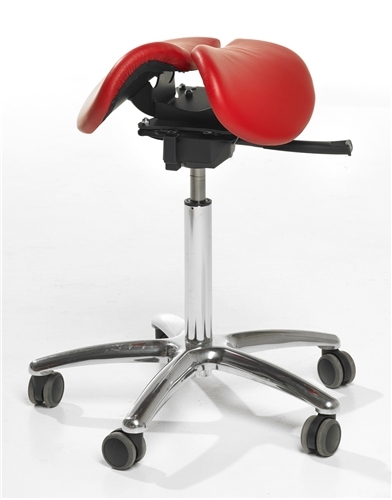 Anatomical split seat design with seat tilt adjustment. For active workers up to 330 pounds. Recommended for factory, welding and heavy assembly. Also recommended for big and tall body types. Forward-backward seat tilt. Seat tilt adjustment and seat height are both controlled with one simple lever. High-pressure chrome pneumatic cylinder for active workers up to 330 pounds. Heavy-duty 600 mm aluminum chair base. Large 65mm casters maneuver easily on carpet or hard floors. Optional deep pile, braking, locking, cleanable (barber) and industrial casters also available. Lifts marked with an asterisk (*) are special order. Contact us for availability. Body height recommendations are approximate and vary with body proportion, height of shoes, riding style, etc. Actual seat heights vary depending upon caster size, base style, etc. Size down 1" - 2" if body proportions are "long torso with short limbs." Size down further if you are heavy and carry your weight in your thighs and buttocks. One handle operates both height and tilt. 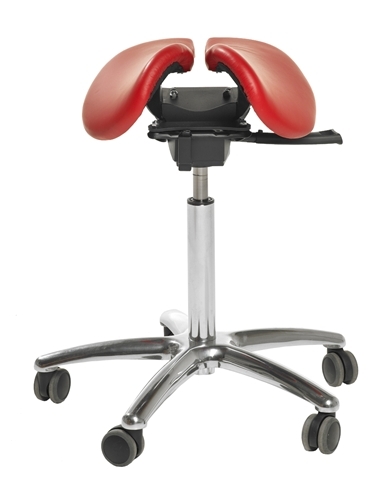 When changing the tilt angle, first pull the handle out (away from the chair, instead of up and down). When the handle in the "out" position, you must first lean your weight forward to release the tilt adjustment. The mechanism is quite stiff so use enough force to get it to lean forward. When you find the right tilt angle, push the handle back to the "in" position and the angle will lock there.